All information is as accurate as we can make it at this point in time, but mistakes do occur, for which we welcome your corrections, questions, suggestions, and updated information. Our goal is to continue to make these web pages interesting and as accurate a portrayal of this line of Brimers as we can. 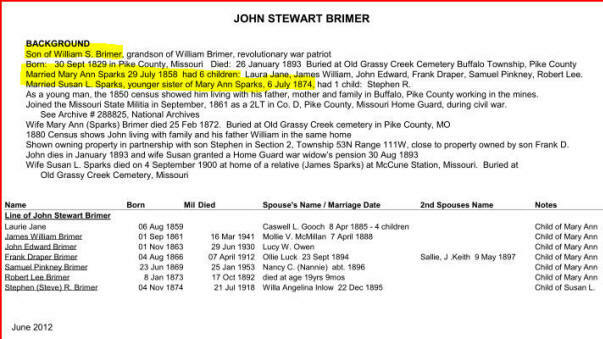 1850 Census for Buffalo, Pike County, MO: John Stewart Brimer is living with his father William S. Brimer and his third wife, Lavina, and John is working in the local mines. John is 20 and he is married to Mary Ann Brimer who is 19 and living there also. 1859 Aug 6: Daughter Laura Jane Brimer born. She would grow up to marry Caswell L. Gooch on 8 April 1885 and have 4 children. 1861 Sep 1: Son James William Brimer born. He m. Mollie Virginia McMilan 7 April 1888 and he died 15 March 1941. 1863 Nov 1: John Edward Brimer born. He m. Lucy W. Owen. John Edward died during the Great Depression, 29 June 1930. 1866 Aug 4: Frank Draper Brimer born. He died 7 April 1912. During his life he married twice (1) Ollie or Olla Luck 23 Sept 1894) and (2) Sarah "Sallie" J. Keith May 9, 1897. Olla lived from Nov 15, 1872 to Jan 3, 1896. Frank married Sallie a little over a year later. 1869 Jun 23 : Samuel Pinkney Brimer born. Married Nancy C (Nannie) Howell about 1896. Died 25 Jan 1953. 1873 Jan 8: Robert Lee Brimer born. Died 17 Oct 1892 at 19 years and 9 mos! 1870 Census Record for John S. Brimer, Pike, Buffalo, MO: John S. is a farmer with an $800 farm and $400 in personal property. Living with him are Mary Ann Brimer, 33, Laura J, 10, James W. 8, John E. 6, Frank 4, and Pinckney 1, all of Missouri. 1873 Feb 25: Wife Mary Ann Sparks Brimer died. Buried at Old Grassy Creek Cemetery in Pike County, MO. 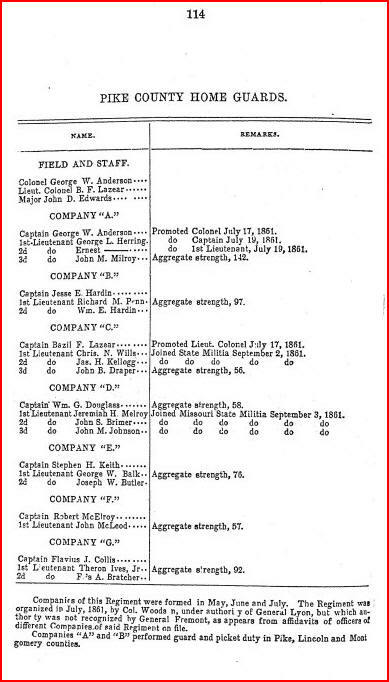 1874 July 6: Married Susan L. Sparks, younger sister of his first wife Mary Ann Sparks. 1893 August 30: Widow Susan Sparks Brimer granted a Home Guard war widow's pension. 1900 Sept 4: Widow Susan L. Sparks Brimer died at home of a relative (James Sparks) at McCune Station, Missouri. Buried at Old Grassy Creek Cemetery, Missouri.